Note: When shooting a movie in the XAVC S format, you must use an SDXC card of Class 10 or faster. This update is only for DSC-RX10 cameras that currently have firmware version 1.00. If your camera firmware version is already Version 2.00, this update is not necessary. This utility is only for use with the Sony® DSC-RX10 cameras. Do not install this utility with any other model. This update can only be performed when the remaining battery level has three bars or more. When performing the firmware update, it is recommended to use a fully charged NP-FW50 rechargeable battery pack. IMPORTANT: You must initialize the camera after the update is complete. This will return all settings to their original default values. Please make note of any settings you have changed before performing the update. You must initialize the camera after the update is complete. This will return all settings to their original default values. Please make note of any settings you have changed before performing the update. On the top of the camera, press the "MENU" button. 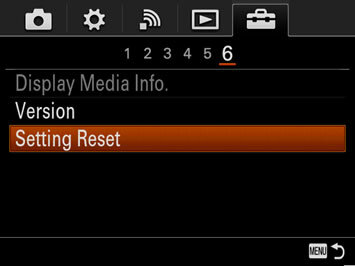 At the menu, select "Setup", and then "Setting Reset". 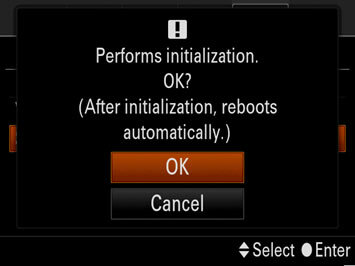 At the "Setting Reset" screen, select "Initialize". 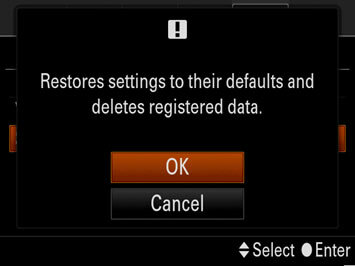 At the "Restores settings..." message, select "OK". At the "Performs initialization" message, select "OK". 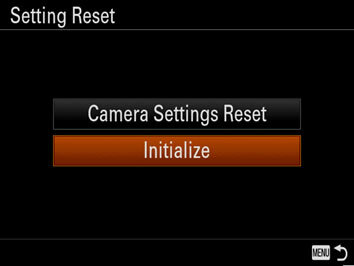 The camera will automatically restart after the initialization is complete. At the menu, select "Setup", and then "Version". Download the Update_DSCRX10V200.exe file to a temporary or download directory (please note this directory for reference). Go to the directory where the file was downloaded and double-click the Update_DSCRX10V200.exe file to begin the Firmware Updater.